HTC One M8 is the 2014 flagship device from HTC. 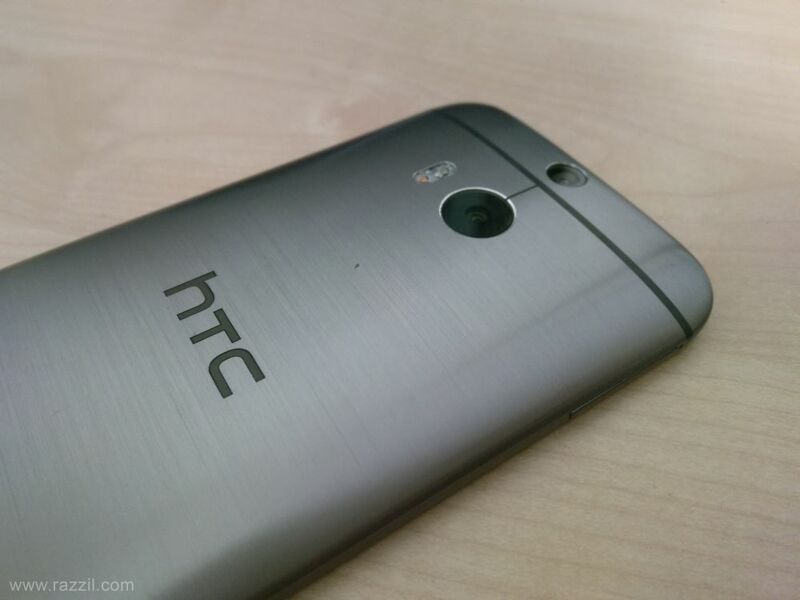 HTC One M8 follows critical acclaimed HTC One metal unibody design. HTC made many improvements over its previous HTC One M7, these include fuller wraparound high quality all-metal design with curved edges that naturally fit in your hand. HTC One M8 has wraparound, high quality all metal frames, Enhanced HTC BoomSound, customizable HTC BlinkFeed, Motion Launch gesture controls, Duo Camera, 5-inch Full HD 1080p display, 2.3 GHz Quad-core Qualcomm Snapdragon 801 processor with fully integrated 4G LTE and Android 4.4.2 KitKat with HTC Sense 6 UI. HTC One M8 is a perfect device and here’s a list of useful things to do to get a near perfect Smartphone. HTC One M8 support Nano SIM and if You’ve MicroSD SIM then make sure you change it with your network provider. M8 also supports MicroSD card up to 128 GB and I recommend you to get Class 10 micro SD card. HTC always push OTA Update to improve the phone software and add new features to its existing Sense 6 UI. The chances are very high that the phone you purchased may have 2-4 month old software and during these periods HTC fixed many bugs and optimize system based on the user feedback. So it’s a good idea to update your phone with new firmware. Next step is to update Apps from Google Play Store. With the introduction of HTC Sense 6 UI, HTC de-centralize the Sense 6. Now most of features are now available as an app. HTC BlinkFeed, TV, Zoe and others are now available as a app on Google Play Store. This step will help HTC to push the next Android version sooner. HTC One M8 also comes with many Google Apps, and it’s good to update those apps to get the new features on your M8. HTC One M8 comes with backup tool where you can import messages, settings, music, videos, photos and apps from your old phone to brand new M8. HTC BlinkFeed collect content from different sources are single feed. HTC BlinkFeed customize content based on your country where you live and you can further customize by adding social networking profiles. You can add Facebook, Twitter, Calendar, Foursquare, Google+, Restaurant recommendations, TV and Zoe apps. To customize the content -> go to BlinkFeed screen, swipe left –> tap on three dot button –> and then Services & Apps and tick mark the checkbox. HTC Sense TV app turned your HTC One M8 into remote that can control the TV in your Room. HTC Sense TV is now included social feeds and live sports stats. You can connect Facebook and Twitter account with Sense TV app. Now when you watch TV, you can see a show’s official Facebook and Twitter pages, along with popular hashtags, right from within HTC Sense TV. With Quick Settings, you can quickly toggle dozen of HTC One M8 settings. You can customize quick settings by tapping on the small edit button in the upper right to re-arrange and remove some of the items from the list. HTC Sense 6 comes with a bunch of themes that you can choose from to customize your M8. Battery bar on notification bar will tell you how much battery life left, but the battery percentage is a good way to get the exact amount of battery life. Sense 6 allows you to change default system font to Helvetica, LCD or your personal one. If you loss your M8 then Android Device Manager help you find, lock, and erase it. This is very helpful feature and you must activate it. ART is a new Android runtime being introduced experimentally in the Android 4.4 release. This runtime is faster than default dalvik. This runtime is still in testing and if you like to test newer build than you switch it from Developer options. Don’t worry if you don’t like this build you can switch to old one. First, you’ve to enable the developer option in your M8. By Default this option is hidden. Once you become a developer, there is new option enable in your settings. The phone will now restart and it’ll update all apps to new runtime. It’ll take time depending on how many apps you’ve installed. HTC One M8 is currently best Android device money can buy and in the upcoming weeks I’ll bring more post on M8 including my review.